We offer a unique pet care service in San Diego. 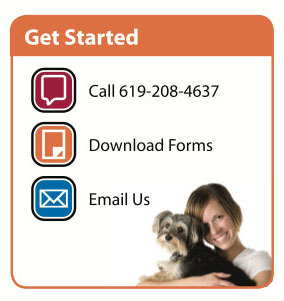 For pet owners we provide in-home medical care, in-home certified pet massage and general pet care services. We also contract our services as registered veterinary technicians (RVT) at local animal hospitals and veterinary practices in San Diego, California. 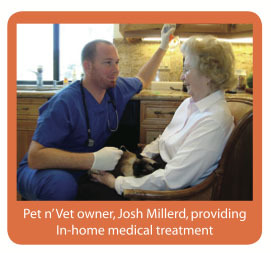 As trained RVTs, Pet n' Vet Support Services, Inc. specializes in caring for older pets that may have special needs or advanced medical conditions. Some pets require diagnostics and pet massage that we can provide in the home under the indirect supervision of your veterinarian. We also provide loving care for pets that require more basic support and attention, such as walks, meals, overnight care, and companionship when their family is out of town. All of the members of our team work or have worked in veterinary hospitals and have been trained in the veterinary field. Some of us may have even worked at your veterinary hospital at times as a contracted relief technician. 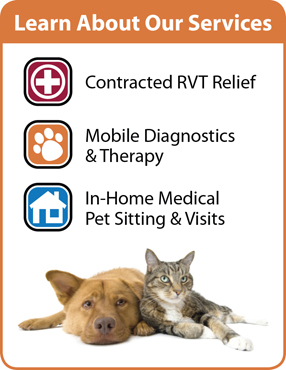 To understand the services we offer, be sure to view our In-home Mobile Diagnostics and Therapy video, In-Home Certified Pet Massage, and our In-Home Pet Sitting/Visits video. We also offer the testimonials of many clients! These clients have used our services to reduce the stress of their pet from visiting their veterinarian or a boarding facility by letting their pet be taken care of in the comfort of their own home. Our services are offered year round, including weekends and holidays. Email us, or call us at: 619-208-4637.